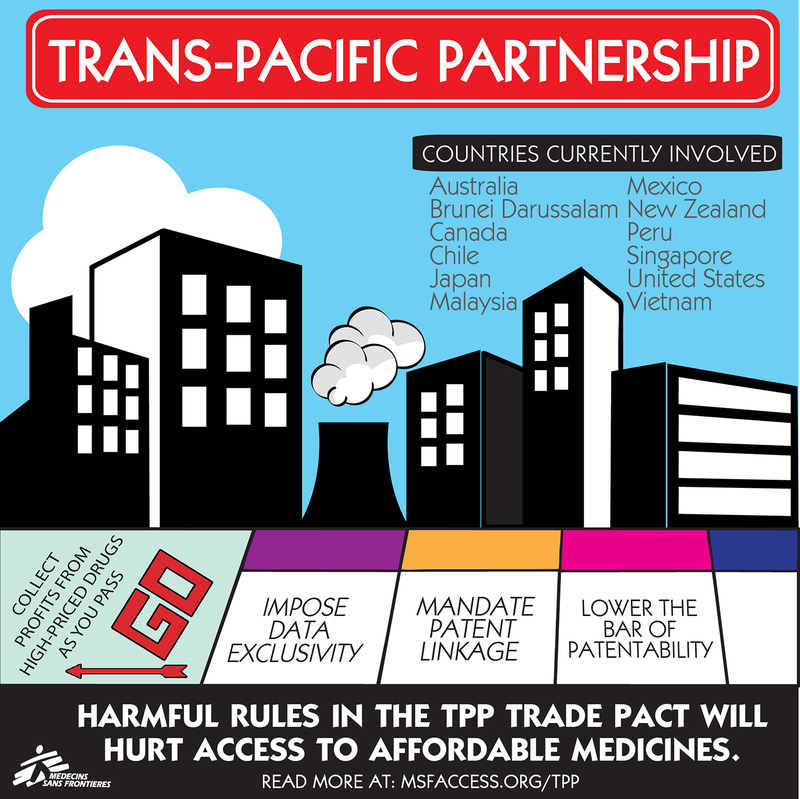 The Trans-Pacific Partnership (TPP) is a trade agreement initially negotiated between the United States and 11 other Pacific Rim nations: Australia, Brunei Darussalam, Canada, Chile, Japan, Malaysia, Mexico, New Zealand, Peru, Singapore and Vietnam. 2017 the US formally withdrew from the agreement. In a revised agreement, renamed the Comprehensive and Progressive Agreement for Trans-Pacific Partnership, the remaining eleven countries agreed to suspend several of the most damaging intellectual property provisions. Although the threat from these provisions is not completely eliminated, as remnants of the original provisions remain in the text, the suspension of these provisions represents a victory for access to medicines. In 2016 after more than five years of negotiations conducted in secret without the opportunity for public review, text agreed by the 12 negotiating countries was officially and publicly released. 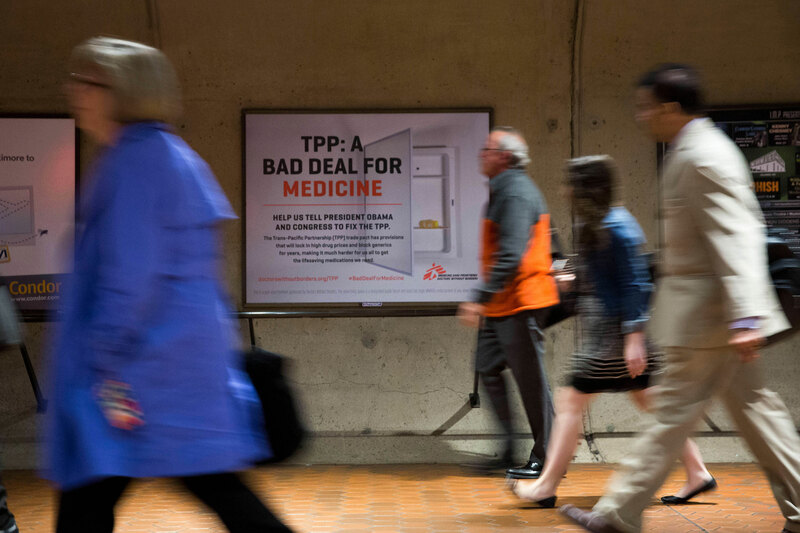 Doctors Without Borders/Médecins Sans Frontières (MSF) expressed serious concern about the inclusion of dangerous provisions that would dismantle public health safeguards enshrined in international law and restrict access to price-lowering generic medicines for millions of people. 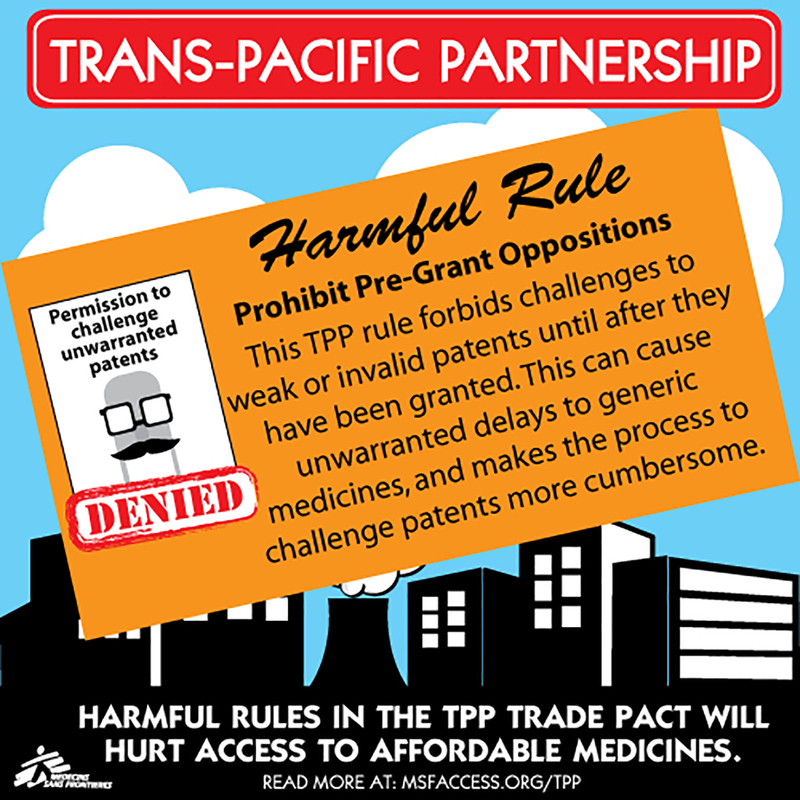 Billed as a model agreement not just for countries in the Asia-Pacific region, but the world over, the TPP was on track to set a damaging precedent with serious implications for many developing countries where MSF works, and beyond. Governments have a responsibility to ensure that public health interests are not trampled by commercial interests, and must resist pressures to erode hard-fought legal safeguards for public health that represent a lifeline for people in developing countries. 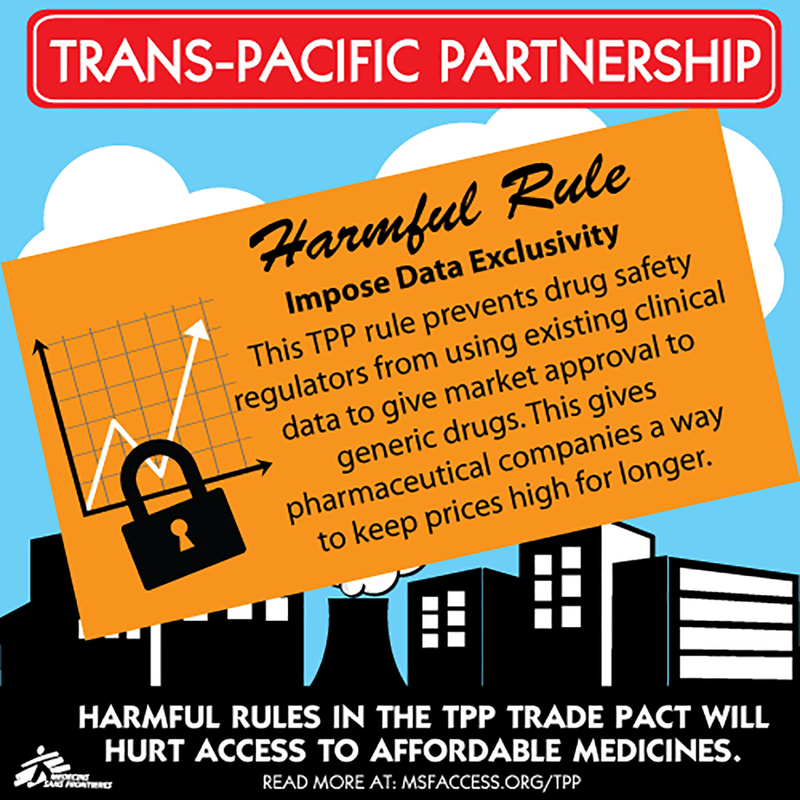 MSF urged the U.S. and all other TPP negotiating governments to not ratify the TPP agreement as long as it included provisions that would harm access to medicines. In the field of health, generic competition saves lives. As a medical treatment provider, MSF relies on affordable generic medicines to treat a wide variety of diseases, including tuberculosis, malaria, HIV/AIDS and other infections that afflict the poorest and most vulnerable populations. And we are not alone in this – the major treatment initiatives, including the Global Fund to Fight AIDS, Tuberculosis and Malaria, the US government’s PEPFAR programme and many others – depend heavily on affordable generics. 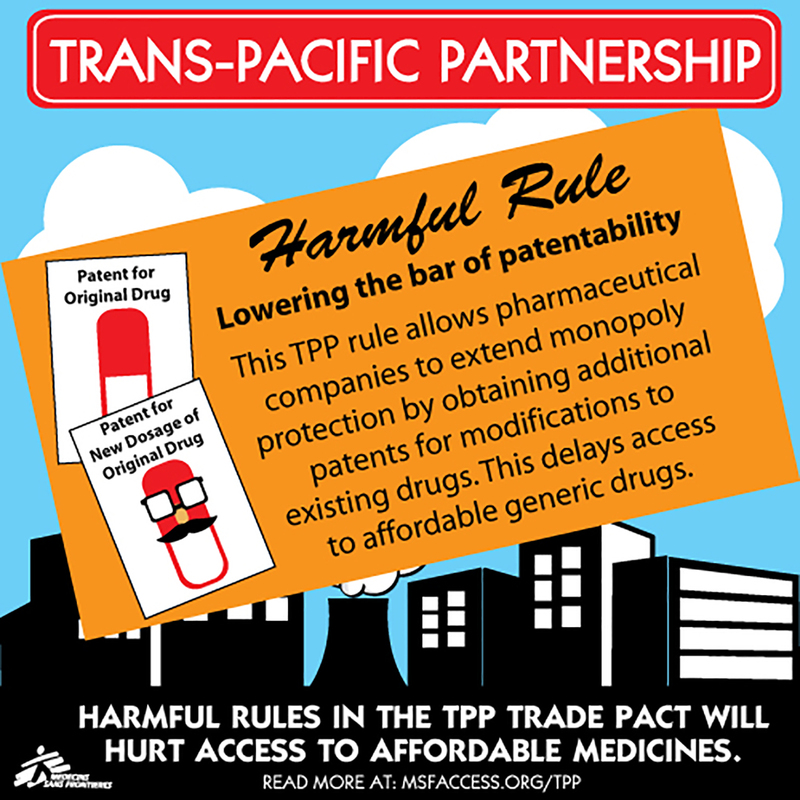 The TPP threatened to cut off the lifeline that generic drugs provide for people living with HIV/AIDS and many other diseases. The availability of generic medicines in a particular country depends on a complex structure of national rules and regulations governing patents and other intellectual property rights. Trade pacts and other international agreements can impact these domestic regulations, and governments have long recognized the need to balance public health interests with intellectual property demands when negotiating trade agreements. In fact, multiple multilateral commitments have reaffirmed the importance of this balance, including the 2001 WTO Doha Declaration on TRIPS and Public Health and the 2008 WHO Global Strategy and Plan of Action on Public Health, Innovation and Intellectual Property. 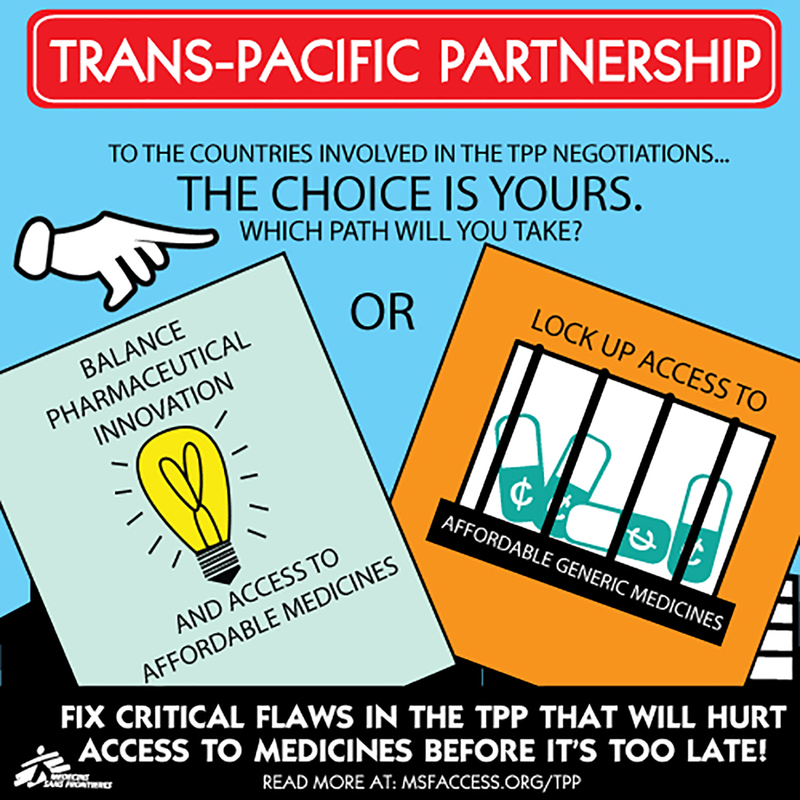 However, despite these commitments, the US government pushed policies in the TPP that represent the most far-reaching attempt to date to impose aggressive intellectual property standards in a trade agreement with developing countries – policies that further tip the balance towards strong IP regimes favoring commercial interests and away from public health. Many of these policies were included in the final text agreed by the 12 negotiating countries. However, following the US withdrawal from the agreement, a number of these provisions were suspended by the 11 remaining countries in the renamed Comprehensive and Progressive Agreement for Trans-Pacific Partnership. These provisions were not removed from the text and the threat remains that they could be enacted in the future, but suspension means that for now they will not be enacted or enforced. For pharmaceuticals and other health commodities, stronger intellectual property regimes mean extended patent monopolies and delayed generic competition, and that translates into higher prices for people who need medicines. 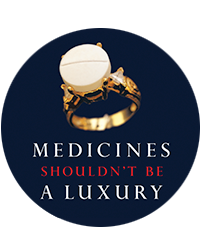 In developing countries, where people rarely have health insurance and must pay for medicines out of pocket, high prices keep lifesaving medicines out of reach and are often a matter of life and death.